Pistols, bullets, uniforms, and two medals of merit for their service during 13 years of police work, were among the items delivered to the Comisión Permanente de Derechos Humanos (CPDH) – Permanent Commission of Human Rights – by two police officials, because they no longer mean anything to them, preferring to defect from the ranks of the National Police. Julio Montenegro, from the CPDH, shows the uniforms and implements delivered by the police. 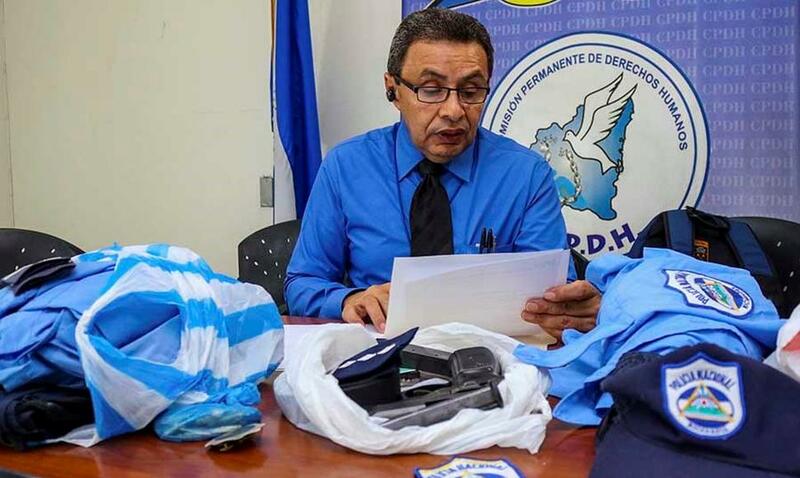 The implements that belonged to the now ex-officers Maycol Alejandro Delgado Vargas and Juan José Blandón Gómez, were deposited in the hands of the CPDH because if they were handed over to their superiors, they feared to be victims of strong reprisals. Julio Montenegro, legal advisor of CPDH, said that the human rights organization was approached by the ex-officials today separately, who said that they were leaving National Police because, in the context of the protests, the commanders forced them to perform acts that were against their moral values and institutional principles. “These did not specify the acts because they were cautious. The truth is that they reasoned that they preferred to leave the ranks of the police because they fear for their personal security,” said Montenegro. “They told us that they do not stay in their homes because they are aware of the punishments applied by their superiors against those who refuse to act outside the framework of their mission,” added Montenegro. The CPPH legal adviser said another officer, with the rank of captain, came in to learn about protection measures, as there are threats against him and harassment from other police members because they believe he is conspiring against the government. “I can tell you many things that happen inside, but I can not give you my identity. That is very dangerous for me and my family,” the captain claimed. Montenegro commented that there are other cases of complaints from members of the National Police. Among the cases that have been followed up is the one of María Teófila Arauz, ex-lieutenant of the National Police, dismissed and threatened for listening on her cell phone the song “Que vivan estudiantes”. Arauz feared that crimes were invented for making the complaint public, however, after a few weeks his son died in a strange road accident, for which the CPDH was also present. Then there is also ex-captain Engel Antonio Aguilar Ney, an architect in the General Administration Division of the National Police, who handled infrastructure projects, until the institution imposed on him a dishonorable discharge, saying that he spoke badly on social networks against the institution. Aguilar left the country and his family can no longer live in his home because of police harassment and threats. One of the most dramatic cases was the accusation of Fátima Vivas, the mother of Officer Faber Antonio López Vivas. The National Police had informed the mother that her son had been killed by a bullet to the forehead, but after an examination that was performed by a doctor at the request of the woman, there was no bullet wound, only blows to different parts of the body. Vivas said his son tried to request his discharge, but he and his family were threatened with death. The Permanent Commission of Human Rights (CPDH) is a Nicaraguan non-governmental organization dedicated to the defense of human rights. It was founded during the Somoza dictatorship, on April 20, 1977 in Managua. The CPDH is funded by the National Foundation for Democracy of the United States.